Our journey starts from Fira, the lively capital of Santorini, where you will wander around its cobbled streets, take fascinating photographs and, of course, relish the caldera unfolding before your eyes. Then we proceed to the neighboring Firostefani village in order to enjoy the breathtaking view of the volcano, the nearby islands and the rest of the Aegean Sea in tranquility. Afterwards we head to the peaceful Imerovigli village where you can admire traditional caves houses, explore its quaint paths and take in the sights. 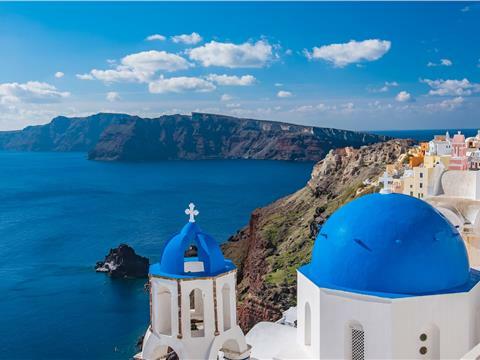 The tour continues to Oia, the picturesque village known for the captivating sunset, the candy-colored houses, blue-domed churches and lovely shops. There you will have the chance to visit the debris of the old castle of Agios Nikolaos, one of the five Venetian castles of Santorini, which is located on the north edge of the island offering a unique view. Our journey ends at Santo Wines, a remarkable winery at Pyrgos village, which provides a magnificent view as it is built on the caldera cliffs. This 4 hour tour is ideal for tourists who visit the island by cruise ship since they can explore the major settlements of Santorini, admire the caldera view and the impressive Cycladic architecture, and, last but not least, cherish a fine wine tasting experience at the winery, as Santorini is famous for its local wine varieties, as well as other traditional specialties of the island, in a few hours. Private 4-Hour Tour Book your Santorini custom tour for a 4-hour duration. Visit Fira, Firostefani, Imerovigli, Oia and Santo Wines.